Bouncing off the Satellites is the fourth studio album by American new wave band the B-52's, released on September 8, 1986. It was recorded in July 1985 and was produced by Tony Mansfield. Founding member and guitarist Ricky Wilson died of AIDS after the album was completed, but several months prior to the album's release. With the band too distraught to tour, the album received minimal promotion and failed to yield any hit singles despite some radio stations initially giving a considerable amount of airplay to "Summer of Love," which managed to peak at No. 3 on the Billboard Dance Club Songs chart. Despite the airplay the song received, the band's record label did not promote the album due to the band's lack of TV or promotional appearances; as a result, it only reached No. 85 on the Billboard 200 chart. The album was seen as darker and more melancholy than the band's previous work, having more ballads. It was, by most accounts, a critical and commercial failure, though three tracks from the album - "Summer of Love", "Wig", and "Girl from Ipanema Goes to Greenland" - have been performed semi-regularly by the band on tour since the 1990s. Recording sessions for Bouncing off the Satellites began in July 1985. During the recording, guitarist Ricky Wilson had been suffering from AIDS. None of the other band members other than Strickland were aware of his illness. Strickland later stated that Wilson "was very protective of Cindy and his family." In an interview, Kate Pierson stated that Wilson had kept his illness secret from his bandmates because he "did not want anyone to worry about him or fuss about him." Because of this and the lack of new material for the album, Wilson and Strickland allowed Pierson and Fred Schneider to contribute solo material they had been working on at the time; they contributed one track each for the album, "Housework" and "Juicy Jungle", respectively. On October 12, 1985, Wilson finally succumbed to the illness, at the age of 32, and though Strickland and a few session musicians worked on overdubs for the recorded tracks, the rest of the band were not involved. Devastated at Wilson's death, the band went into seclusion and did not tour to promote the album. Nevertheless, Bouncing Off the Satellites eventually reached 85 on the Billboard 200. Cindy went into a deep depression after her brother's death, while Strickland retreated to Woodstock, New York, and Pierson and Schneider stayed in New York City. The band initially felt that it would be impossible to continue without Ricky until they reformed in 1988 for the recording of their next album Cosmic Thing. The album debuted on the Billboard Top Pop Albums chart at #97 on October 4, 1986 and peaked at #85 the following week. By the third week it had fallen out of the Top 100 and was off the chart by the second week of 1987. All tracks written by The B-52's, except where noted. Keith Strickland – guitars, keyboards, backing vocals, bass (side one tracks 1-2, side two tracks 4-5), sitar on "Wig", harmonica on "Ain't it a Shame", percussion on "Housework"
Kate Pierson – vocals, keyboards on "Housework"
Tom Beckerman – lead guitar on "Juicy Jungle"
John Coté – backing vocals and "all other instruments" on "Juicy Jungle"
Mark Mazur – guitar and bass on "Housework"
Tim Rollins – guitar on "Housework"
Shep Pettibone – additional production and re-mix on "Summer of Love" and additional production on "Girl from Ipanema Goes to Greenland"
^ a b c "The B-52's Chart History". Billboard.biz. Billboard. Retrieved 30 November 2016. ^ Wener, Ben (August 11, 1998). "The B-52s party on! : Nearly 20 years after turning the pop world on its ear, the group is gaining in popularity". The Spectator. p. D-10. ^ Patterson, R. Gary (2004). Take a Walk on the Dark Side: Rock and Roll Myths, Legends, and Curses. Fireside. p. 174. ISBN 0-7432-4423-0. ^ Poundstone, William (1994). "Backward Messages on Records". Biggest Secrets. Harper Perennial. p. 229. ISBN 0-688-13792-X. Retrieved December 22, 2009. ^ "Hard Rock/Metal/Punk". Backmask Online. Archived from the original on August 19, 2006. Retrieved July 25, 2006. ^ "Bounce It Off Your Satellite". June 19, 2015. ^ a b "YouTube". www.youtube.com. ^ Edmondson, Jacqueline, Ph.D., ed. (2013). Music in American Life: An Encyclopedia of the Songs, Styles, Stars, and Stories that Shaped our Culture. ABC-CLIO. p. 89. ISBN 978-0-313-39348-8. While the band was recording Bouncing off the Satellites (1986), tragedy struck. Ricky Wilson died from HIV/AIDs-related illness. The remaining band members, who were too distraught to tour and promote the album, decided to take a hiatus from their musical careers. ^ "The B-52s - Biography, Albums, Streaming Links - AllMusic". AllMusic. ^ Erlewine, Stephen Thomas. 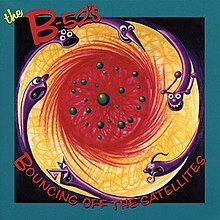 "Bouncing Off the Satellites – The B-52's". AllMusic. Retrieved August 23, 2016. ^ Considine, J. D. (2004). "The B-52's". In Brackett, Nathan; Hoard, Christian. The New Rolling Stone Album Guide (4th ed.). Simon & Schuster. pp. 67–68. ISBN 0-7432-0169-8. Retrieved November 2, 2011. ^ Christgau, Robert (December 2, 1986). "Christgau's Consumer Guide". The Village Voice. Retrieved August 23, 2016. This page was last edited on 20 February 2019, at 00:45 (UTC).